Thank you for visiting our website and for all your continued support for Jason and the 7s team. We hope you will take a look at each page. You can do so by clicking on each topic at the top of this page. A 7s will light up and take you to that page. To read past articles or press releases, just click on the Press Releases about Jason at the bottom of this page and it will take you to the news articles and past release about the 7s team. If you scroll down the Homepage, you will find Jason's racing stats. Just click on Check Here for Complete Schedule and Results and that will take you to Jason’s race results and the World of Outlaw Schedule. That will help you to remember when to tune in to DirtVision. This is a free site to listen to live audio of each race or, for a nominal fee, you can view the races that are video taped live. If you click on Jason, you can read a bio of Jason's racing experience, past accomplishments, and other interesting info. Click on the Photo Page each time you enter, as we are adding to them fairly often. We have pictures from the past several years and some very early ones as well. Our Sponsor Page list the companies that help keep Jason racing week in and week out. They are a very important part of our racing program. If you are at a race and you see a representative of one of our sponsors, let them know you appreciate them supporting Jason and Sprintcar racing. You can click on most of them to see just what they are all about. Merchandise Page. On it you will find t-shirts, hooded sweatshirts, decals and other items. We'll be adding more items soon, so check back each time you visit the site. Check out the Links Page. There you will find a link to several racing series, message boards and other racing information. Just click on a link and away you will go. Please sign Our Guestbook on the last page. Let us know what you think about the site, the photos, the merchandise, or if you would like to ask a question, you can do that to! 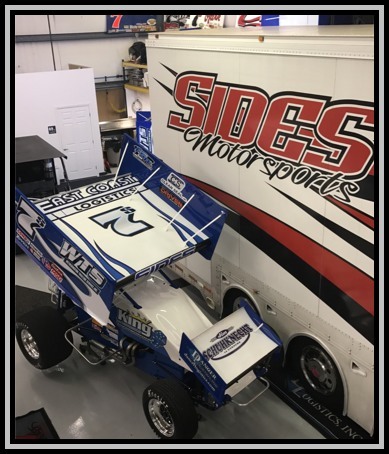 We'll answer your question just as soon as we can on Facebook @ Sides Motorsports or you can send a personal message on the website. You can click on the facebook icon on this page to take you to our page. Like us!